Bliu Bliu Review – Is This the Best Language Learning Game? You Decide! Have you ever wondered how learning a new language could be easier and more fun? The founders of this program think that it should always be fun. I believe so as well. Let’s have a closer look at interesting language learning game called Bliu Bliu. Have you heard about LingQ, Babbel, Duolingo, Memrise or some other language learning game? If you have, then you may already know that it’s possible to learn new languages by playing fun games. I improve my French and German skills hugely only by playing games. No textbooks, no grammar, only games. Of course, I have use many other methods also but I learned my initial skills with these games. Bliu Bliu is another language learning game that makes learning a new language fun and easy. You don’t need to study grammar because you will learn it automatically. Your vocabulary expands over the time course as well. 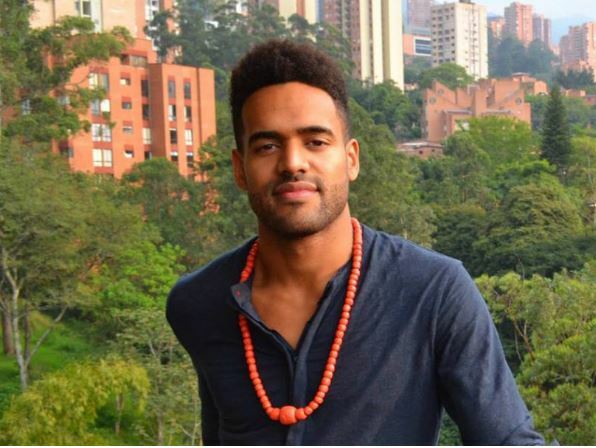 Here is a 30-second pitch from the CEO of Bliu Bliu, Claudio Santori. 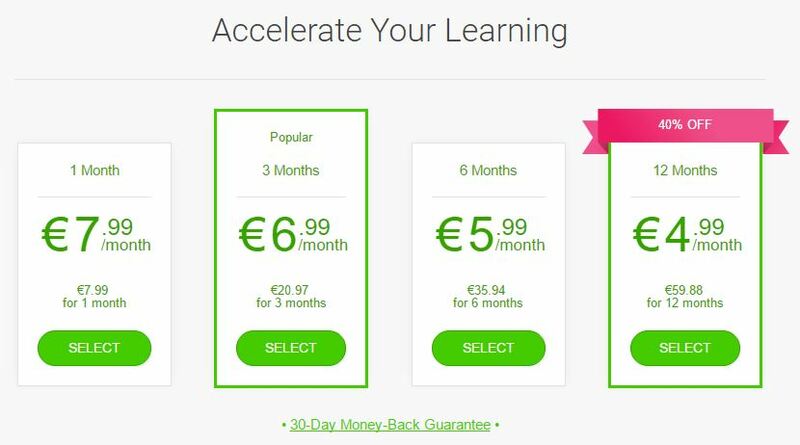 Have a quick look what he tells about this wonderful idea of learning languages with Bliu Bliu. How to Get Started on Bliu Bliu? First, you choose what language you want to learn. Bliu Bliu has an incredible amount of languages (more than 100!). They have even languages that I have never heard of like Hausa, Kyrzyg, Toki Pona and Xhosa. It means that you will find for sure a language that you want to study. You can sign up to Bliu Bliu quickly by using your Google+ or Facebook account or your email. It takes around 10 seconds to sign up. Then you will be given a short starting level test which takes only less than 30 seconds. 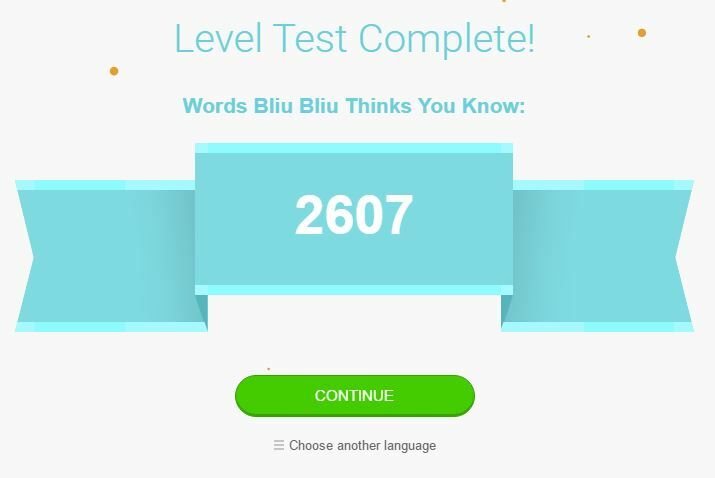 It will show approximately your current level and Bliu Bliu will give you language exercise based on your current level. After finishing a short test you can start studying your languages. In a picture below you can see how Bliu Bliu Dashboard looks like. On the left side you can choose what kind of exercise you want to take. Do you want to practice with texts, words, books, challenges or in a language wall with other students. You have an opportunity to choose (total) beginner or advanced exercises on several different subjects. Like you can see in the picture above, there are some categories like “Most Popular, About Me (video), Good Morning, recorded by Natives” and so on. I clicked on the most popular. It opens a text in my target language (German). Then I can listen to the text while reading it. Some more advanced words are highlighted with a red color. By moving your cursor to any word, you will see the translation for that word. 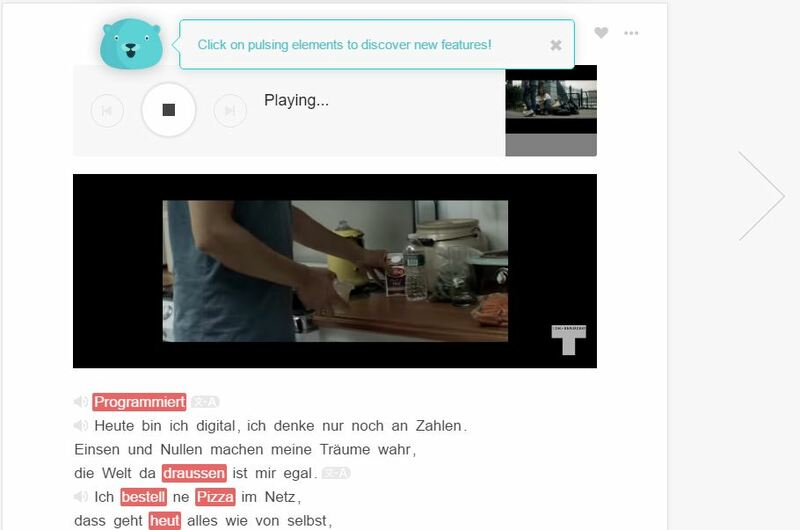 Bliu Bliu is using Google Translator to bring the translations for words. That’s why it’s highly scalable. My experience shows that translations are very accurate. You can also find some Youtube (music) videos on Bliu Bliu (see an example below). It’s like a karaoke where you can learn new vocabulary with songs. If you find songs that you like, this method can be very fun and profitable. I have learned some new vocabulary by listening to songs in my target languages. It’s also highly enjoyable. At some point you will remember the songs and the lyrics will may ring in your head. You realize that you are already thinking in a new language! One of the greatest benefits of language learning games is that they can keep you highly motivated with their creative features. For example, in Bliu Bliu there are a few tricks that keep you motivated. It shows in the top how many words you already know (or have learned) in your target language. By clicking the number, it will show your progress in the chart. That helps people who like making progress and are visual. Bliu Bliu also shows in numbers how many new words you have learned today, this week and this month. 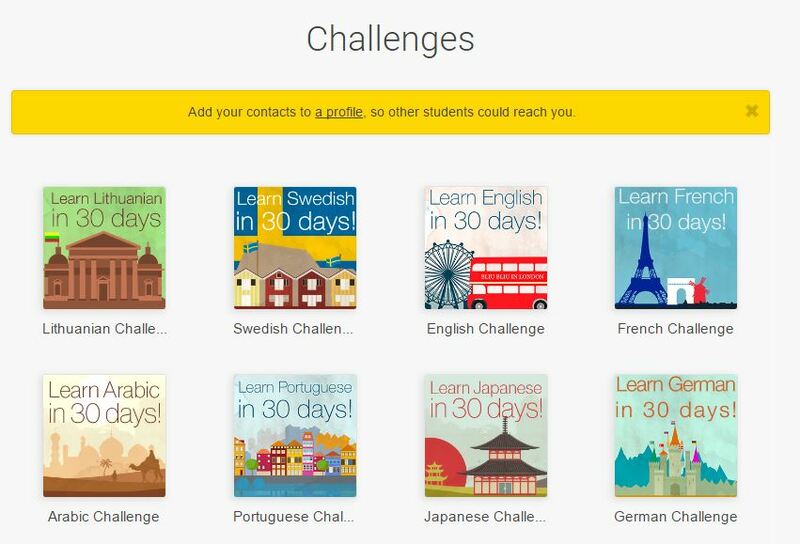 Bliu Bliu also offers 30-day language learning challenges. In each challenge there is a limited number of spots available. The date when a challenge start is beforehand decided. Each challenge has a native speaker as a host of challenge to help students to move forward. You will have online group meetings with other students and with the host. You will be given personalized content, tips and trick and in the end of the challenge they give you a Bliu Bliu Certificate. Bliu Bliu is based on a community that helps each other to learn a new language faster. Anybody can add new texts and content. There are also books in many languages and you can add one as well. Reading or listening to a book can be a very effective way of learning a new language. I have listened to audio books in almost any language that I have studied. When you are reading a book in Bliu Bliu, you can quickly see a translation for words that you don’t know. Compare if you were reading a normal book. You would always need to move a book away and check a word in a dictionary. Reading a book in Bliu Bliu is much more faster and effective for learning a new language. You can use Bliu Bliu for totally free but they have a limit how much content you can go through with a free account. If you want an unlimited access, you need to have a premium membership. Here are their pricing plans. As you can see in the picture above, their premium membership is quite cheap. The cheapest plan costs only 4,99€/month. Does Bliu Bliu Have an Android or Apple App? Not yet but founders have promised that it’s coming soon. You can still use Bliu Bliu quite conveniently with your smartphone. Just go to their website and start learning. At least I found it very easy to use with a phone as well. I like that more and more language learning games are being made. It means that people have a huge interest for learning languages. The other big thing is that competition helps apps become better. If there would be only one language learning game, then it wouldn’t have so much pull to improve. The competition forces founders to improve their games because otherwise they will lose members to other apps and language games. I have found language learning games very beneficial and Bliu Bliu seems to be as well. Learning new words in a natural context is much better than trying to memorize them one by one. Have you already tried Bliu Bliu? What did you like? I love reading comments from our visitors, so don’t hesitate to take part in the discussion. I respond all comments within 24 hours (usually it takes only a few hours.) If you have also any questions regarding Bliu Bliu, I will be more than happy to help you out. languages have never been easy for me and fluency in Spanish would be immediately beneficial to me. I work in a call center and every time I get a Spanish speaker, I have to coordinate with a third party interpreter service. This adds several minutes sometimes to what started as one simple question. I’ve learned other things in a game type environment and this seems like a good way to learn. If this works out I may try Mandarin next. I have a number of subtitled kung fu movies and it would be a blast to know what they are REALLY saying! I know that things can change and languages can be easy for you in the future. 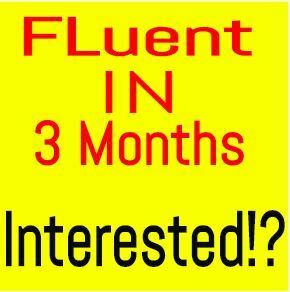 Have a look at Fluent in 3 Months course. Benny Lewis revolutionized how I learn languages and I believe that it can open your eyes for wonderful things as well. This is really good. I will keep in mind next time I want to learn a new language. It seems easy and fun to learn by using this programme. I liked this post because it walks you through the programme very easily and makes it comprehendible. I am happy that you liked my review of Bliu Bliu. Their service is very creative and I like their approach to language learning. It will for sure help you to learn the next language that you want to master. Very interesting article. There are so many tools out in the internet for learning new languages, but I never thought about learning a language through games. I am bad at memorization but I am very visual, so learning with games will definitely make it easier and fun to learn. I already know Spanish (my name native language) and English. I tried learning French but the pronunciation was a challenge and memorizing words was tricky, so I might give it a try again with this method. language games have helped a lot with learning new languages. 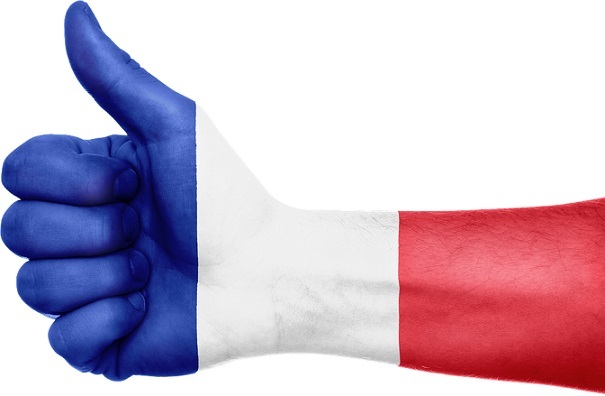 I am sure that they will help you too with French. 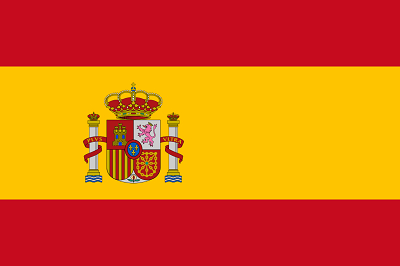 You already speak Spanish and English so you have a big advantage compared to many other French students. This is pretty cool. There are so many great ways to learn these days. And learning a new language is very rewarding and fun. Plus I want to reach into more business markets. So there will not be an language barrier. I will look into this program. Is this good for children as well? My son loves to learn. yes, I believe this could be good for children as well. You can have a look and check what your son likes it. Learning language for business reasons is very common and profitable. It helps to have a better contact with business partners if you speak their native language. This is new to me. Never crossed my mind that we can learn languages properly through playing games. My son has recently started his German class in school. It has been 3 months now. A bit difficult for him to improve as there isn’t anyone (besides his class mates) to communicate with. Just about the right time I found your article. Thank you for introducing this. Bliu Bliu can be a great tool for your son to improve his German skills. Another great options are LingQ and Duolingo. I know from my own (and from other people’s) experience that it’s totally possible to learn a new language by playing games. 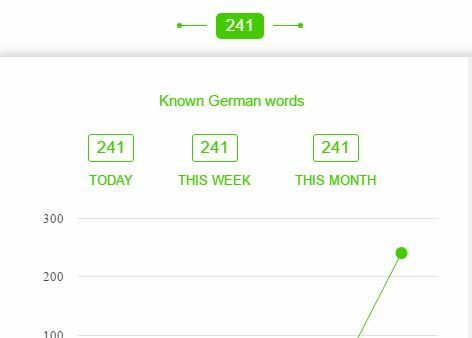 I started studied German by playing language games and I saw how I quickly improved. Ps.If you want to find to find somebody who can speak the languages that you want to practice, have a closer look at iTalki. It’s 100% free. Thank you so much Roope. Will check them out. Very good Sharon. I believe they will be a big help. At least for me online resources have been a huge help for my language learning. I have never heard about Bliu Bliu, however, I know some other similar language learning programs. You say after registration, a user has to attend a short test that will determine the current level. The test can only be attended by a person who already has some knowledge of the language, in case the person does not know the language how will be take the test. Is this for the first time learner, for the people who want to start from zero. Based on the results of a “test” they’ll give you exercises that fit your current level. Bliu Bliu! As odd as the name sounds, am sure the experience will erase that thought drawing from your review. I’ve tried something of this nature before and found it quite helpful. Am going to take your word for it and go ahead to check this one out. I love learning something new every now and then. NOTE: Hausa is actually my main language. It’s the primary language to a large majority of northern Nigeria. 40% of Nigerians speak and understand Hausa. It’s also one of the most widely spoken language in Africa raking after Swahili and Arabic. I had to share that with you..now you know what Hausa language is. It’s surprising that I haven’t heard of Hausa before. Or maybe I’ve heard but I’ve forgotten because I wasn’t familiar with it. Anyway, thank you very much for sharing it. Thanks. It’s possible you have cos it’s a very familiar language. BBC uses it sometimes in some special productions. Just let me know when you’re ready to learn Hausa. This app seems very interesting and it looks really cool too. Then again, I feel like Duolingo is still better compared to this. I guess I’m a little biased considering I haven’t tried this yet, but in the cons you have said that the community is not that large yet, and I feel that this aspect is really important. Although, it has cool features that Duolingo does not such as the videos. I guess it would be nice to try this one out. You can, of course, try both. I like Duolingo, LingQ, Babbel, Bliu Bliu, Memrise and I think all of them are great. All practice takes you closer to fluency. Every training session goes in the bank.